Since a probably inappropriate age, I’ve loved monster movies and prison stories. Whether it was the old Godzilla movies I’d rent at the local library (or the even better Godzilla vs. Bambi I’d watch repeatedly with glee) or movies and TV shows like The Shawshank Redemption and Oz (like I said, inappropriate), these types have stories have piqued my interest in a very real, hugely divergent way for a long time. But much to my chagrin I had never experienced a story that had married those two rather different genres together. Zander Cannon’s Oni Press series about a Supermax prison for Kaiju (or giant Japanese monsters) is pretty much the comic I never knew I always wanted, and through its first three issues, it has been an absolute pleasure to read. Pairing those two disparate ideas together – it really is a prison story but with monsters as inmates and an Ultraman crew as guards – has been one of the most enjoyable experiences I’ve had from comics this year, and it’s because of what an inventive and gifted storyteller Cannon is. Naturally, I had to chat with him about the book, and you can read about how the book came together, his process, the language within the prison, the type of inmate series lead Electrogor is, and much more. Thanks to Cannon for talking with me, and if you haven’t read it yet, get to your local comic shop or ComiXology app and do so. You won’t regret it. In the letters column of Kaijumax, you’ve made it abundantly clear that this book is a love letter to stories of kaiju past. What made you want to celebrate those types of stories with your own one? ZC: One of the things I think is important as a cartoonist — or a creative person in general — is to really draw on the things that make you happy, no matter how supposedly silly or ridiculous they are, and then adapt them to your own style. That last part — your own style — is important, since typically the things I’m talking about here are things that are a product of their decade, or their country of origin, or a general lack of self-awareness. To try to replicate it perfectly seems a little disingenuous. I get a lot of joy out of monster movies, whether they’re Eastern or Western or giant or not, and so although the style itself is not really my style in terms of how I tell a story, I felt like I wanted to adapt those ideas and use them to tell my own, more downbeat and satirical story. The funny thing is that, like I said, I really wouldn’t be too interested in doing a so-called ‘straight’ monster comic. I really felt like I had to put a conceptual spin on it, hence the prison story structure. One of my favorite parts of the book isn’t actually the kaiju aspect of the story, but how you depict the Monster Island prison as a real prison drama, or a real feeling prison drama if it starred kaiju. Is that another genre you enjoy in particular, and what do you find particularly interesting about fusing it together with your love of kaiju stories? ZC: I do like prison dramas, mostly because the character lineup generally means that the morality of the story is situational. One character can be evil in one situation, and good in another. That’s always been something I’ve liked. Also, in terms of your standard men’s prison drama like Oz, it’s a place where the masculinity can be cartoonishly over the top, which I think fits with these monsters, which are to a man intended to be physical representations of hubris, overwhelming force, war, nature’s fury, etc. But the odd thing is that I think if it came to it, I would be pretty reluctant to write a proper prison drama, because — luckily — I’ve got no connection to actual prison. I like to think I have some things to say about, say, being out of touch with the modern world, or feeling marginalized, or addiction, or negotiating various power structures, but I have very little to say about prison itself. Placing those ideas in a preposterous high-concept mashup helps me to address the character business and the philosophical questions with a little more clarity, not to mention being quite a bit less controversial. Besides color assists from Jason Fischer, this is an all you extravaganza. When you’re putting an issue of this together, what’s your process from starting an issue to finishing one? ZC: First of all, let me just say choosing to do everything from the writing to the coloring on a monthly book is a questionable move, at best. That being said, I really enjoy making comics like this, since it means you can make each element of the art or lettering or coloring tell a little bit of the story. The fact that I’m doing this book digitally, besides from making it even remotely possible timewise, means that I can combine the making of the line art and color pretty seamlessly. A tight feedback loop like this allows me to see what’s working and what’s not quickly as well as looping in editorial on the story decisions I’ve made, all on the fly. Electrogor pretty much breaks my heart right and left. Unlike his hardened inmates in varying gangs, he seems like a pretty chill monster that just wants to get out and take care of his family, but he’s still hard when he needs to be. Is his role an Andy Dufresne like one – the guy we root for in a dark setting – or might he be more of a Tobias Beecher type where he just doesn’t know the true monster he has within? ZC: There’s a little of that darkness. I always want to make sure we examine what our hero is made of, and give him an internal struggle that can sync up with the raw plot elements. The second I feel like a protagonist is too good, or too certain of him- or herself, I lose all interest in the story. I mean, I do feel like Electrogor is good at heart, so when his path has moments when he is being reasonable and in a reasonable situation (that is to say, it’s boring), we’ll step over to where someone is doing something awful to someone else. Like I said about prison dramas, it is nice that you can have an imperfect character that, due to the terrible situation around him, is as close to heroic as you’re going to get. Even though everything he does is really in his own self-interest to some degree, the urgency with which he goes after it is the stuff that makes for compelling reading. When you just think of the premise, it seems like a comic that’s going to be over the top and ridiculous. I expected something like Ulises Farinas’ “Gamma” if you read that. But it’s got a lot of depth and emotion to it, as I mentioned in the last question. How important is finding some real humanity in this monster tale? ZC: I’m sure there’s a philosophical component to it — I do like to sympathize with characters and feel some emotion even in a wild story — but the main reason for me is simply trying to make the book a page-turner. Jokes will get you through an issue or two, but if you don’t care about what’s happening, you won’t bother getting the next one. When everyone has something they want, it hurts when they don’t get it, and it feels great when they do. I also feel like I came to realize, after my graphic novel HECK came out, how sentimental the comics buying public really is, all evidence to the contrary. Everyone seems to jump at crazy Twitter-ready ideas like sharks fighting bears and Dracula fighting Galactus and monsters in prison, but the ones they stick with and love are things like Saga and Mind MGMT that really deal with characters and their desires and emotions in a deft way. He’s a dirtbag, but Gupta’s a really interesting character in that he talks a big game about wanting the monsters gone, but more than anyone, he needs them. He preys upon them, but he seemed to handle Electrogor with a bit of tenderness (for him) in #2. In any good prison story, you have to have that morally suspect guard, but is there anything about Gupta that makes him more than meets the eye? Are we going to get similar looks into the personalities of the other guards of the island? ZC: We’re absolutely going to go into the other guards, the other prisoners, and many characters we haven’t met yet and see their stories. I keep fleshing out bits of the world so that I can incorporate all of my kaiju/tokusatsu favorites into the book, so there are always new things happening. Gupta is pretty interesting. I try to have a gentler side to every villain, something about them that makes you wonder if you wouldn’t do something similar in the same situation. He’s implied to be deeply in debt and has a job that doesn’t pay very well, and I like the idea of creating a little bit of class warfare even in a story that has a lot of more pressing concerns. I also like the idea that we’re in a world that’s so morally gray that we can kind of have a fleeting sense of sympathy or support for a character that’s pretty amoral, even as he manipulates everyone around him. I love the prison slang in the book, from the Lizzas to Cloakers. Be honest, was that one of your favorite parts of creating this book? It seems like a blast, and it’s weird how natural calling people “my lizza” feels. Have you ever considered running a glossary in the back of an issue? ZC: Oh, it’s totally my favorite part of the book. The idea that the story can more or less be played completely straight, and yet still have one or two or three jokes embedded in each panel, I think gives the book a really surreal feeling. It also give the implication that this world is very harsh, while still keeping everything pretty PG. I think if you had them actually swearing or doing a lot of the stuff you see in a real prison drama, the charm of the book would evaporate fast, but as it is, I think it kind-of-sort-of qualifies as an all-ages book. There’s nothing that’s really that mature about it there on the page; it’s all what’s implied. As for a glossary– I’ve thought about it, but I hope that the implied meaning comes across as you read the book and makes you think about it for a second. I like having these little coded jokes in there for people who love the movies this is all based on. You actively encourage readers to submit requests for potential kaiju in the book and on your site, which is totally awesome. Did you do that because you wanted to incorporate community involvement, was it because it’s just too difficult to keep coming up with new kaiju background filler, or is it a combination of both? ZC: It’s never difficult to come up with new monsters. 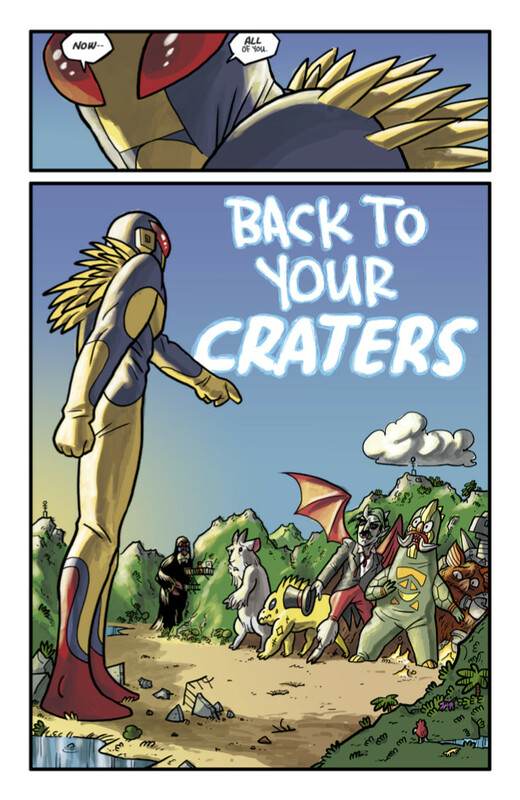 To be perfectly honest, it’s harder to be consistent with the monsters that show up more than once than it is to put in new ones every time, since all I do is open up an image search of Ultraman monsters or Godzilla monsters and just start grabbing elements and colors and cramming them all together. But I like the idea of people having a favorite monster type or reminding me of a movie I haven’t seen and then getting into a whole new template for both monsters and prison inmates. 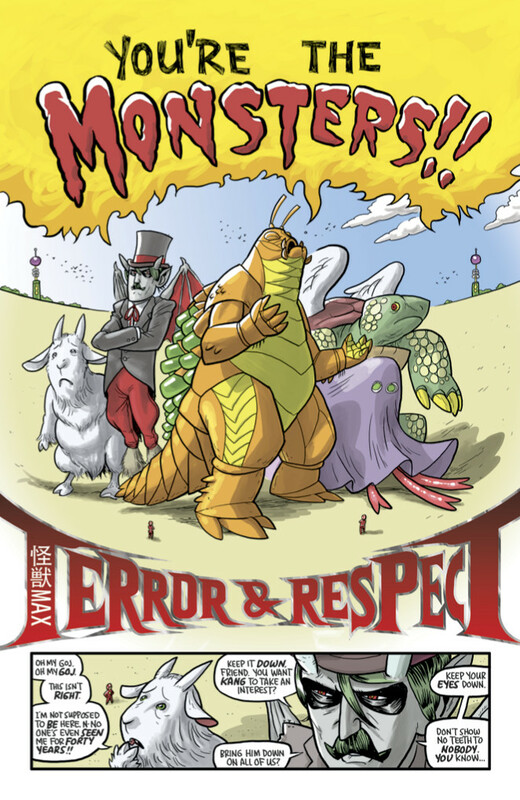 The fact that the comic has a letters page and invites all of that interaction with readers, I think, makes it very clear that this is a comic that’s not just for me or to try to be popular or whatever, it’s a book for everyone who loves monster movies. I like that you said that this comic isn’t just for you, and as you said, the letters page – which is something not everyone includes these days – makes that obvious. 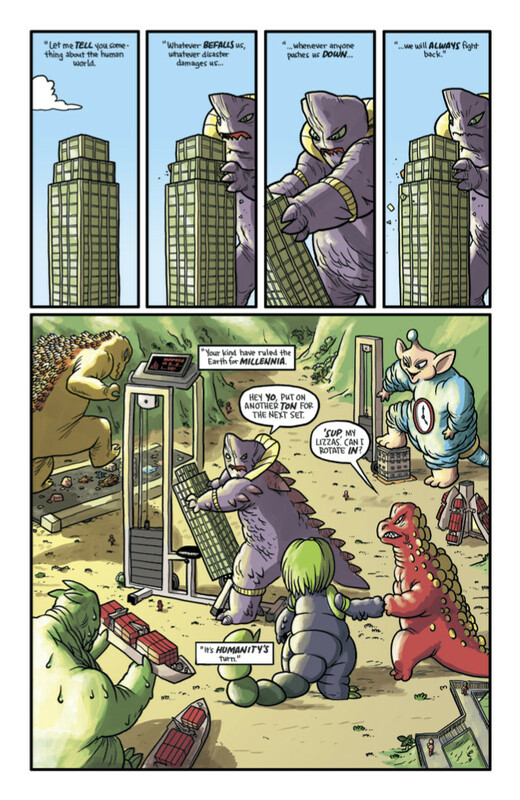 Do you view the letters page as a continuation of the Kaijumax experience? It’s a joy to read in itself, and I really dig its super casual nature and the monster movie review you put in and everything. It’s a pretty perfect way to close an issue for me as a reader. ZC: One thing — though not the only thing, for sure — I think has contributed to people not picking up monthly titles is that they’re not as rewarding of an individual experience anymore. Most comics are just chapters in a larger story, and people want to make sure they’re going to see it through before they get invested. I’m all for grand narratives, and there are several in Kaijumax, but I also wanted to underline the fact that the book is meant to be episodic, with each issue telling a complete story while also advancing the various threads. I think having a letters page and a hidden monster in each issue, Kaiju requests, movie reviews, as well as some essays and spare thoughts (not to mention the audio commentary on the website), will hopefully make the experience of seeking out each issue worth the trouble (and there does seem to be some trouble, here and there). I loved going back to read the letters pages on comics I liked and it made me feel good that there were people that liked the comics I did, enough to write them a letter, even. We’ve been getting more and more letters and more and more fan art, and that’s really exciting, as much or more so than getting the tweets and mentions on social media. Lastly, even through two issues, you can feel the power struggle between the different gangs of the book brewing underneath everything else in the story. As a big fan of “The Warriors”, I have to ask: who is the Cyrus of Kaijumax’s world of gangs? My money is on Victoria Von Vilestra, because running a casino on the moon seems like a power move. ZC: Well, based on my limited understanding of the Warriors (I know, I know), the power move of uniting the gangs has not occurred in Kaijumax, and for that matter, the monster that intends to do it has not shown up yet. But consolidation in the gangs is coming, and of course that leads to strange bedfellows, a lot of betrayals, and a death or two. All art on the page is by Zander Cannon and from Kaijumax #1.